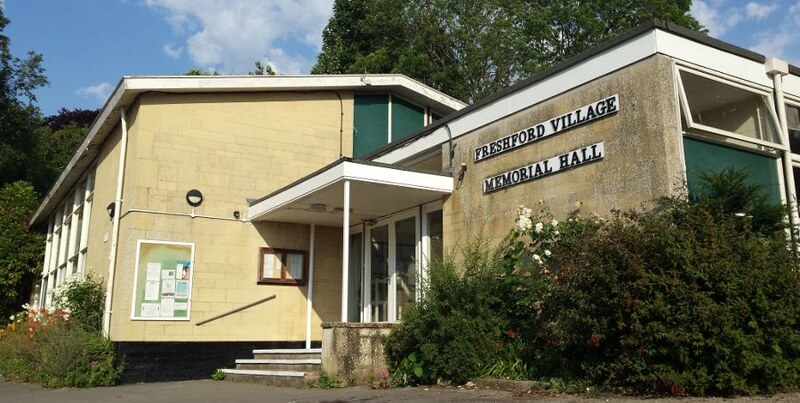 Set in the beautiful Somerset countryside, but with easy access from the A36, the Village Hall offers a large hall with badminton court and proscenium stage, committee room, meeting room, toilets and a kitchen, all fully equipped and maintained to current standards. It provides on-site parking in its adjacent sizeable Village Hall car park, next to the Galleries Village Shop. Behind the Hall is the Queen Elizabeth recreation field and children's playground. More photos of our venue can be found on the Gallery page. Fully equipped kitchen with two modern dual oven cookers with ceramic hobs, warming cabinet, serving area, full height fridge, microwave, toaster, kettles, washing-up area, portable urn and boiling water dispenser. Crockery, cutlery and glassware for 100 diners is included with the basic hire charge. A good range of modern saucepans, frying pans, and cooking utensils is included. A freezer is available in the green room, and can be switched as needed. Large hall, seating up to 150 people. 8m wide by 16 metres long excluding the stage. A full size badminton court is drawn out, and badminton nets are available for use. Dedicated elevated stage with lighting rigs, and extendable staging. Back-stage areas available, including a green room. Grand piano on stage, and upright piano in green room. Modern stage lighting controls including a portable Zero88 Juggler lighting desk allowing control of the stage lights from the back of the hall, and Zero88 Dimmer packs. Use of the stage lights requires an extra charge of £30 per production. 44 sqm airy meeting room, which can be hired separately at a reduced rate. Large foyer (28 sqm) with open access to the kitchen. Extensive hooks for coats and bags. Perfect welcome area for functions. The village hall has a large car park with spaces for approximately 30 cars. The car park is shared with the village shop and is also used by parents at school drop-off and pick-up, so at certain times not all spaces are available to the hall. Free WiFi is available throughout the village hall and playing field. The hall is adjacent to the Galleries Shop where are wide range of goods are kept in stock. The shop has its own cafe which can cater for events held in the village hall.